Up to six cameras on Chiswell Island are controlled using custom software running on desktop computers. Cameras are equipped with pan/tilt/zoom functions and also with windshield washer and wiper functions. Video and audio signals are sent from the cameras via Cat5 cable to a control tower on the island. Signals are then sent from the control tower to ASLC via microwave transmission through a repeater station approximately 10 miles south of ASLC. Researchers at ASLC control the system using UHF signals sent in the other direction. The control tower and all the cameras are powered by a 12 volt battery system that is kept charged with solar and wind generators. There is also a weather station at the control tower and real-time data on wind speed and direction, barometric pressure, and air temperature can be requested at any time from researchers at ASLC. Additional video links to Steller sea lion haulout sites on Grotto Island and near Cape Resurrection were installed in 2001 and 2004, respectively. Those sites are frequented by sea lions during winter and spring and enhance our knowledge of the behavior and biology of this species during those seasons. We apologize the current video link is not working. We are working on securing additional funding to provide realiable streaming video of the sea lion rookery. A multitude of behavioral, population, and life history studies have been accomplished through the use of this remote video system, resulting in several published and widely read scientific studies. 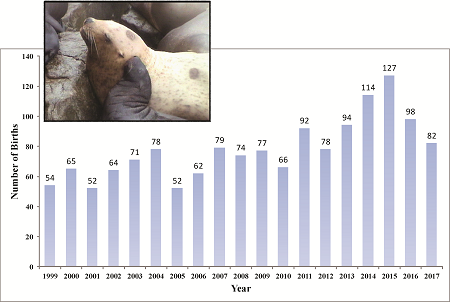 These studies help to inform resource managers of potential threats to the recovery of Endangered Steller sea lions and areas that need further research. Past and current studies from this remote monitoring project include the nature and extent of maternal care and alloparental care, pup mortality, predation by killer whales, pupping site fidelity, survival rates, reproductive rates, and the first published account of live-born twins in this species (see Related Publications). Long-term mark-recapture studies have been conducted to estimate juvenile survival and female reproductive rates. We have found that both of these vital rates are greatly improved during the past decade compared to during the population decline between the mid-1970s and late-1990s. Variation in maternal care had a large impact on survival probabilities for juveniles between 1 and 2 years of age. The figure below shows that males and females that continued to suckle beyond 1 year of age (MFs) had about a 90% chance of survival, whereas survival probabilities were much lower for males (Mw) and females (Fw) that were weaned after their first year. Female reproductive rates have also improved during the past decade compared to the period of the population decline (Maniscalco et al. 2014). However, in the two most recent years pup numbers have dropped off again (see figure below). We are currently examining factors that may be affecting the observed variation in pup production and reproductive rates such as changes in food availability between years.